The Malagasy giant rat is no ordinary rat and bears little resemblance to its better known cousins, having been isolated on the island of Madagascar for much of its evolutionary history (3). About the size of a rabbit, this rotund rodent is by far the largest on Madagascar and, much like a rabbit, possesses long, pointed, conspicuous ears (4). Also known as the Malagasy giant jumping rat, this unusual species has elongated hindlegs and large hind feet that allow it to leap almost a metre into the air. 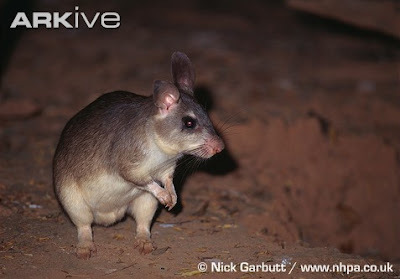 However, contrary to this common name, these ‘jumping rats' rarely jump, unless startled or to avoid predators (5). The short fur is greyish-brown to reddish on the upperside, darkest on the head, while the limbs, feet and underparts are white, and the dark tail is covered with short, stiff hairs (2). Found in a small area of western Madagascar called Menabe, northeast of Morondava (6). A village splits the habitat in two, isolating a northern population from one further south (7). Restricted to sandy coastal areas of primary dry deciduous forest, mixed with baobab trees and permanently covered in dry leaf-litter (2). Like rabbits, Malagasy giant rats live in burrows, which typically consist of a network of tunnels, each around 45 centimetres in diameter and up to five metres long (2). These are occupied by a family group consisting of a monogamous pair, their current offspring and their female offspring from the previous year. Families maintain and defend a territory covering three to four hectares (6). Territory borders are marked with urine, faeces and scent gland deposits. The burrows are not only used for raising offspring, but also for protection against predation and heat during the day and heavy rain during the night (4). Pairs mate for life, but if one mate dies they are normally replaced within a few days or weeks (6). Litters of one or two young are born in the rainy season in late November and early December (5), after a gestation period of 102 to 138 days (4). Young stay within the safety of the burrow for the first four to six weeks before venturing out (4). Male offspring leave their natal territory and are able to breed at one year, if they can establish a territory and attract a mate. Female offspring may remain with their parents for up to two years before they get sexually mature and disperse (4). Males are thought to be monogamous in order to help protect their young from high levels of predation and the contribution of male parental care is assumed to be very high (6). This nocturnal rodent spends the day within its burrows, emerging at dusk to forage either alone or in pairs on the forest floor (4). The rats are primarily herbivorous, feeding on fallen fruit, seeds and leaves, digging for roots and tubers and stripping bark from saplings (4), although in captivity some have also been observed eating invertebrates (2). Like many of Madagascar's unique species, the Malagasy giant rat is thought to have become highly endangered due to habitat loss and disturbance, and predation by and competition with introduced species (8). For centuries Madagascar's forests have experienced successive waves of degradation at the hands of human colonists, each with different destructive patterns of land use (7). In more recent years, illegal and commercial logging, charcoal production and burning to clear land for agriculture or cattle pasture have all had a devastating impact, often changing open forest into dense, shrubby undergrowth unsuitable as rat habitat or destroying the vegetation completely (3). The rats continue to suffer from human disturbance in the remaining forests, which are used by the villagers to gather firewood, collect honey, dig up edible roots, and hunt tenrecs and lemurs (3) (7). Predation by introduced predators such as dogs may also be playing a significant role in this species' decline (3).